Given the current state of commercial air travel, any effort to get the flight over with more quickly could be considered noble. Supersonic flight is the obvious answer. That technology isn’t even new. The Concorde’s maiden flight was in 1969, and service ended in 2003. Getting a plane to fly faster than the speed of sound isn’t the problem—it’s quieting the thunderous sonic boom that’s heard on the ground. 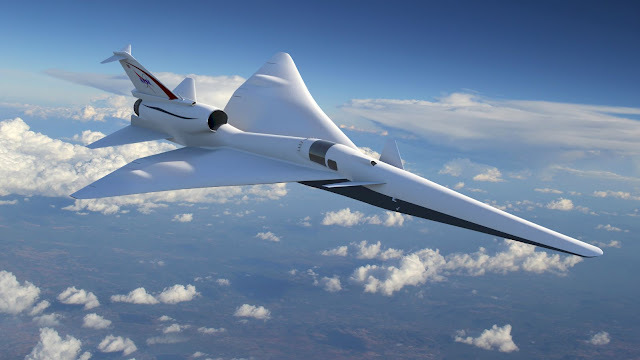 In 1973, the US government banned overland commercial supersonic flights.Now NASA and Lockheed Martin think they have a winning design for a quieter supersonic jet, one that will create a hum similar to that of an air conditioner below the flight’s path. The Concorde, whose last flight was in 2003 due to economic problems following a fatal crash three years earlier, was propelled to a cruising speed of about 1,350 miles per hour with four Rolls-Royce engines. NASA and Lockheed, however, realize the supersonic jet of the future needed to be scaled down. They rethought the design, which they liken to that of a paper airplane, and choose a single engine.Their solution focuses on changing the paths of the shockwaves caused by supersonic flight.As it jets through the air, a supersonic plane is forcefully pushing aside air molecules, creating shockwaves (think of the waves a boat makes as it glides through water) that move outward.What is heard on the ground, after the fast-moving plane has passed, is the sonic boom. The area where that sharp noise is heard is called the boom carpet. NASA and Lockheed’s design places a single engine on top of the plane, which NASA hopes will help lead to a “sonic thump” instead of the jarring boom. NASA and Lockheed say the design can prevent the N wave of a sonic boom—so called because of the form the pressure changes make when charted. The waves can be made to not pile up on one another with the new design, which ensures they are spaced farther apart, creating a less jarring “shaped boom.”Part of the problem with current supersonic booms is “the startle factor,” Peter Iosifidis, a Lockheed Martin engineer who manages the Quiet Supersonic Technology (QueSST) program, tells Quartz.”When you look at traditional supersonic airplanes, they weren’t designed for a low sonic boom. They were designed for speed, and some might argue, efficiency,” says Iosifidis. NASA successfully conducted wind-tunnel tests of the design this year and is working on building a demonstrator jet that could fly by 2021. Researchers would fly it over communities to collect sound data and survey reactions. They’re not alone in their quest. Supersonic startups like the Richard Branson-backed Boom Technology and Aerion Corp, supported by Texas billionaire Robert Bass, are also trying to bring back ultra-fast commercial flight, focusing more on less-restricted flights over the ocean.